My friend was trying to check some train schedules at the Indian Railways website. When she logged on she was surprised to see that there was an ad banner by their (Indian Railway’s) competitor placed on the home page. She knows I love such interesting details on marketing and advertising so she sent me the link and I went digging to see what’s up. And I came shocked. 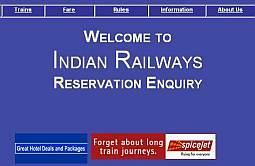 Indian Railways which is defined by Wikipedia as the state-owned railway company of India having a complete monopoly over the country’s rail transport is now supporting Spice Jet. What is Spice Jet? SpiceJet is one of India’s newest start-up private airlines. Their aim is to compete with the Indian Railways passengers traveling in AC Three tier coaches. What was Indian Railways thinking when they allowed this banner to go online? Laluji please wake up! Before you know the competition would have eaten have your passengers sitting right on your head. Don’t we have enough of a deficit in our railway budgets to afford this kind of business loss to private “airline” operators. On an extended note, if the government does want to promote air transport and make it affordable and accessible to the common man – Why not think of linking up with Indian Airlines and Alliance Airways? Let the right hand help the left hand make some money.